Voyagez de Beijing à Xian en train à grande vitesse pour découvrir ses attractions les plus célèbres pendant deux jours. Visitez les guerriers en terre cuite, les remparts de la ville antique, le clocher et la tour du tambour avec votre guide privé, qui partage des informations sur chaque site. 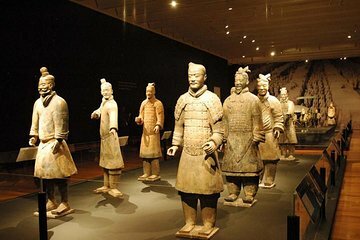 Passez une demi-journée au musée des guerriers et des chevaux en terre cuite, classé au patrimoine mondial de l'UNESCO, pour voir ses mausolées les plus importants et découvrir l'histoire de la Chine. Comprend les transferts entre l'hôtel et la gare, les transports privés à Xian, les frais d'entrée, le déjeuner et un guide expérimenté. Fabulous experience. All the drivers and guides were great. Everything went so smooth not a glich in the deal. Worth the money. The lunch we had was probably the best meal we had in China. I felt rushed. Imagine waking up early and taking the train from Washington, DC to Chicago, having dinner, then lunch the next day, and returning to DC in time to go to bed. That is about what happens here. Since hotel is not included, it would not cost the tour operator anything to offer additional unguided days for the same price. Three or four days in Xian would be welcome, since you've invested 12 hours getting there and back, over less than two days. First stop after leaving the train station was the city wall. For an investment of I think 90 RMB and 1- 1.5 hours, you can ride a bike around the top of the city wall. Had I thought about it more, I would have sprung for a bike for our guide too. Recall as you ride around the city that it was a stop on the Silk Road, visited by the likes of Marco Polo. Lunch after the warriors the next day was at a genuinely fancy place. I felt a tad underdressed in my tourist clothes, but my biggest issue of the whole trip is that the guide was not allowed to dine with us. Add 20 to the price for her meal and let me continue to learn about Xian from the guide please! Kelly was great company and a great guide. It was a shame to sit there knowing that she was nearby, yet not able to continue to educate me over a pleasant meal. Hotel and train station pick-ups went off without a hitch, and our guide was great. For two of us, we were provided with a minivan, driver, and guide. Overall it is a well-run operation. Be sure to visit the Muslim Quarter in the evening -- it is a memorable experience.